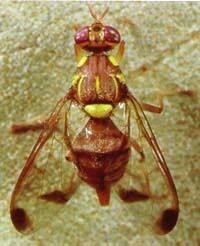 The adult melon fly is approximately the size of a house fly, about 6 to 8 mm long. The body is mostly orange-brown with a faint black T-shaped mark on the abdomen, and the clear wings have a large brown spot at the tip and a brown stripe at the hind edge in addition to lighter striping along the leading edge of the wing and near the base. The female has a short tube at the end of its body through which the pointed ovipositor can be extruded. The maggots (larvae) are creamy-white, legless and attain a length of 10 mm. The melon fly is native to Asia, but has spread to other parts of the world including Africa and the Pacific Islands. In Asia, it is recorded from Bangladesh, Bhutan, Brunei, Cambodia, China, Hong Kong, India, Indonesia (Java, Kalimantan, Sulawesi, Sumatra, and Timor), Iran, Laos, Malaysia, Myanmar, Nepal, Pakistan, Philippines, Sri Lanka, Taiwan, Thailand, and Vietnam. It has been introduced and established in the African countries of Benin, Burkina Faso, Cameroon, Cóte d’Ivoire, Guinea, Kenya, Mali, Niger, Nigeria, Senegal, Tanzania, Togo, and Uganda. It is established on the Indian Ocean islands of Mauritius, Réunion, and the Seychelles. In the Pacific it is established in Bougainville Islands, Guam, Hawaii, Indonesia (Irian Jaya), Mariana Islands, New Britain, New Ireland and Papua New Guinea. The melon fly was first found in California in 1956 and has been captured sporadically over the years, but all infestations have been successfully eradicated. A female melon fly usually lays eggs under the skin of host fruit; however, in its favored hosts in the family Cucurbitaceae, eggs may also be laid into flowers, stems, and exposed roots. These eggs hatch into larvae, or maggots, which tunnel through the flesh of the fruit or other plant part. Decay organisms can enter the fruit, leaving the interior of the fruit a rotten mass and making it unfit for consumption. The developing larvae go through three instars. At maturity, the larvae drop from the plant and burrow two to three cm beneath the soil to pupate. Adults later emerge from these puparia and dig their way out of the soil. Breeding is continuous, with several generations possible annually. Completion of the life cycle normally requires one to two months under warm conditions, but may be five to six months under cooler conditions. Worldwide, over 80 different kinds of fruits and vegetables are recorded as hosts. The most commonly attacked crops are cantaloupe, cucumber, watermelon, melons, squash, and gourds. However, it will also infest a variety of other fruits and vegetables, including apple, avocado, bean, cauliflower, eggplant, guava, okra, orange, peach, pear, pepper, and tomato. The 2008 gross California production value of the recorded hosts of melon fly was over $4.5 billion. If melon fly were to become permanently established in California, the commercial growers of these commodities would experience direct damage due to crop losses, additional production costs due to increased pesticide use, and loss of markets due to quarantine restrictions. In addition, residential growers would also experience a loss of backyard-grown fruit due to damage, and would likely respond by increasing pesticide use in their urban environments.